How to optimize your PPC funnel for limitless performance increase. tl;dr: a 30% increase anywhere in your PPC funnel has the same impact on total funnel conversion rate. Widen your horizons, find a weak link and strengthen it. As a thought exercise, lets assume our goal is to increase the performance of this funnel by 30%. Right now it's at a break even state, with an ROI of 0% - we're at $1 EPC (Earnings Per Click) and $1 CPC (Cost Per Click). So how do we reach ROI 30%? Lets start with the very front component of the funnel. What changes can we make inside of AdWords to get to 30% ROI? We could lower our max CPC to lower our effective CPC by 23%. 100 clicks @ $0.77 CPC = $77 to make a $100 contribution sale. That means $100 - $77 = $23 profit. $23/$77 = approx 30% ROI. But lowering max CPC isn't always the right choice because we have to worry about the impact on volume of clicks. Lowering your CPC usually means a decrease in average position which means less volume. If we're budget capped, meaning that available volume at $1 CPC exceeds our chosen daily budget, then we're in good shape. We'll get less available clicks at a lower CPC but who cares. If we're getting 100 clicks for $100 out of 1000 clicks available, and lowering our CPC means we'll get 130 clicks for $100... Even if our pool of 1000 available clicks gets dramatically reduced to 300 available clicks (because lower max CPC negatively impacts ad rank which negatively impacts available impression share), we're still good. I'll leave the theory of why "if you win the quality score battle, you win the AdWords war" to another post. For now, lets go strait to the takeaway (stats below from a study by Wordstream). 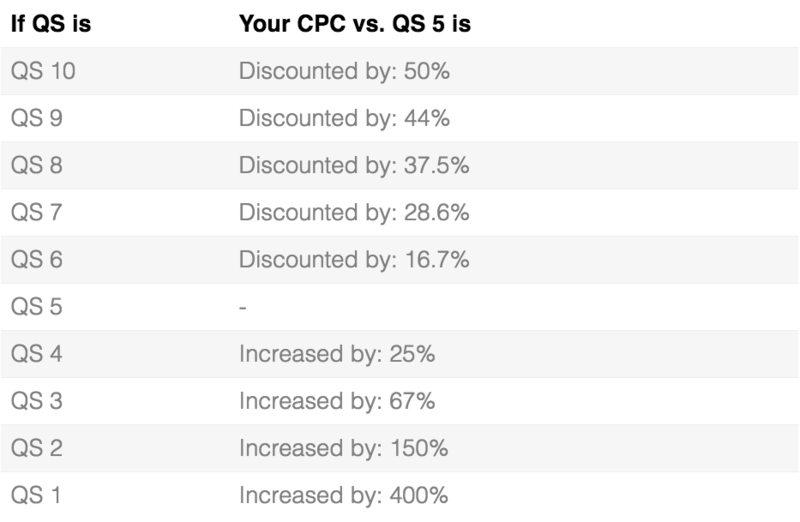 If we shift our QS from 5 to 7, our CPC is discounted by 28.6%, meaning we reach 40% ROI without a loss of volume. In fact, we'd likely get a boost in impression share and actually increase volume simultaneously to ROI! The way you increase QS is mostly by increasing your CTR (click through rate) - assuming your ad relevenace and landing page quality aren't handicapping you. So really this section now becomes about how to increase CTR. To increase CTR you improve your targeting (detailed in the next section) or even better, you write better ads and speed up ad testing (we built Opteo to help you with that). Dig through Search queries and add negative keywords - ideally you've also structured your account with the Alpha/Beta structure. Imagine we discover that Search Partners makes up 20% of your account budget and severely underperforms compared to Google Search. And then we discover that we've mixed mobile and desktop campaigns and mobile makes up 40% of your budget and also underperforms. And you have performance data but no bid modifiers for hour of week or geo locations. Reaching our 30% ROI target could happen very quickly and easily. Assuming we spot no low hanging fruit in the AdWords account, we can move on to digging into the sales page. The PPC Landing Page section of the Navion Insurance Case Study gives you some ideas on where to go with this. You can find other posts about landing pages this here: PPC Landing Pages. A 30% lift in conversion by split testing your landing page is completely achievable. Quick wins often include keeping important elements above the fold. This alone can easily give you a 30% conversion rate boost. Working on your copy, especially your headline and bullet points can have a huge impact. Adding trust indicators is another good one. Conversion Rate Optimization, or CRO, is a world in and of itself. It's extremely high leverage and powerful. Go out there and apply the theory in split tests of your own. Remarketing is very often severly under-utilized. With our 1% conversion rate, that means 1 out of 100 people buy our product. But what about the other 99? Some aren't ready to buy yet but will be in 1 month. Some just got distracted and need to be reminded. Some aren't interested in that product, but may be interested in one of your other products. Some think it's too expensive but would buy it if you ran a promotion. Total: $150 spent, $200 made, $50 profit. This is where I think it gets fun. Now we're leaving the world of pure AdWords and entering the world of broader internet marketing and funnel crafting. What if we added the component of an upsell to our funnel? Many shopping cart software have a "1-click-upsell" feature which allows a user to add a complimentary product in one click, after having checked out and added their credit card details (which they only have to do once). It's always suprising how often people take up a good upsell offer. In our case, if we offer a complimentary "One Time Offer" for an additional $150 contribution, and 20% of buyers take us up on the upsell, that generates our $30 extra on top of our $100 core contribution which brings us to our 30% ROI. This is Amazon's famous strategy of "People who bought this were also interested in..."
"But I don't have another product to upsell!" Fear not, fellow marketer. We can borrow other people's products. With a bit of brainstorming we can find another business, adjacent to ours, that shares our target market and negotiate a profit share agreement with them. This world is called affiliate marketing. If our commissions times our successful upsell rate is greater than $30 then we will have reached our +30% ROI target. Something magical happens when a prospect becomes a customer, no matter if they bought for $1 or for $10,000. So the idea is you sell a product for $10 (that should sell for $100+), and massively overdeliver in value. Blow them away. So what if instead of trying to arbitrage profit on the front end, we take a long term view and value qualified subscribers. This changes up our funnel considerably. If we offered some form of "Lead Magnet" ie. a free video guide, a free eBook, a free webinar, a free tester product etc. in exchange for a name and email, then we could then follow up with them to continue to add value and sell to them over time. First with a tripwire offer, then with a core offer, then with a more expensive offer that maximizes your profit... You get the idea. The goal is to have the ability to pay as much as possible per subscriber - and specifically, be able to pay more than your competition. This is why Expert Photography does so incredible well on AdWords: Case Study - Why Expert Photography Wins on AdWords. Now imagine if we combined these. The effects compound. If we increase performance by 20% at 2 different spots in the funnel, we get +44% increase, not +40% in performance in the funnel. Are you starting to see how powerful this mentality and framework is? Widen your horizons, find a weak link and strengthen it.